For robust tracking of opt-ins, purchases and overall lead response, ONTRAPORT adopts the terminology and UTM parameters used by Google Analytics for its trackable marketing channels: Campaign, Lead Source, Medium, Content and Term. Add these parameters to your URLs and you'll know the origin of new contacts entering your marketing funnel. ONTRAPORT automatically keeps track of the traffic and leads generating new opt ins from each UTM-powered URL, and displays the results in the sub-collections nested in your Tracking menu. Tracking is available for ONTRAPORT Pro and higher account levels. The Lead Information section of individual Contact Records will show what UTM-enabled link was used to opt-in or purchase. ONTRAPORT tracks both the "first attribution" and "last click" in the Contact Record. First attribution: Only Contacts who use a UTM-enabled link to initially opt in will have the first attribution fields populated. They are then locked and cannot change so you always know what link converted them from prospect to Contact. If you have imported the Contacts, or they opt in on a form without clicking a UTM-enabled link first, those fields will remain blank. Last attribution: The "last click attribution" fields will be populated for any Contact who clicks a UTM link and then fills out a form, even if they did not originally use a UTM-enabled link to opt in to your database. This means you can see the last UTM-enabled link that prompted either a form submission or a purchase. Using utm_content and utm_term is optional. However, if you begin to use them we recommend you always use them due to the way cookie tracking is done. Remember that only new opt ins are counted in most of the tracking statistics, along with those Contacts who previously opted in and had a UTM tracking cookie. 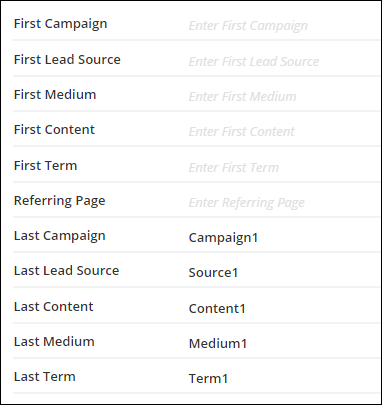 These contacts will have values in the First Campaign, First Lead Source, First Medium, First Content, or First Term fields in the Contact Record. The Tracking feature counts both unique visits and total visits, but counts them separately. This means that one person may click on your link and visit your page five times, however, only one of those clicks is counted in the unique visits column of your tracking display while the total clicks are recorded in your total visits column. The reason for this being that it is much more critical to see how many individuals ended up clicking your link rather than the amount of clicks one individual has performed. This is not only essential for establishing a more accurate ROI but also determines the original tracked link that a prospect may click because the original action is always the most crucial. Clicks from Contacts who have not opted in using UTM, who have the First Campaign, First Lead Source, First Medium, First Content, and First Term fields empty in their Contact Records, are not counted in every statistic. By Campaign - use this to identify a specific marketing campaigns or promotion. Use on every UTM-powered link. By Lead Source - use this to identify a lead source. Example: conference or search engine. Use on every UTM-powered link. By Medium - use this to differentiate marketing mediums. Example: email, postcard, pay-per-click, radio. Use on every UTM-powered link. By Content (optional) - use this to distinguish between ads or links that point to the same URL. This is ideal for split testing website, email, or Landing Page content. By Term (optional) - use this to indicate the keywords for an ad. Example: business building or entrepreneur. # New Clients - Number of contacts that purchase a product after using this Marketing Tracker, even if the purchase comes at a later time. Days to First Purchase - The number of days a lead is on a campaign before their first purchase. Life Time Value - Life time value of this Marketing Tracker. This metric compares sales to leads in the amount of time the campaign ran. See our blog article How to Hyper-Target Your Marketing Campaigns with ONTRAPORT for more hand's on use of these metrics! For an example usecase, be sure and check out our UTM Tracking usecase article here! Navigate to Administration > Advanced Features tab > Tracking and toggle the feature on. A Tracking tab should appear in your primary navigation. Select URL History from the Tracking menu. Enter a Destination URL. The ONTRAPORT tracking script must be installed on the page. Tracking scripts are automatically installed on ONTRApages and WordPress sites integrated with PilotPress). 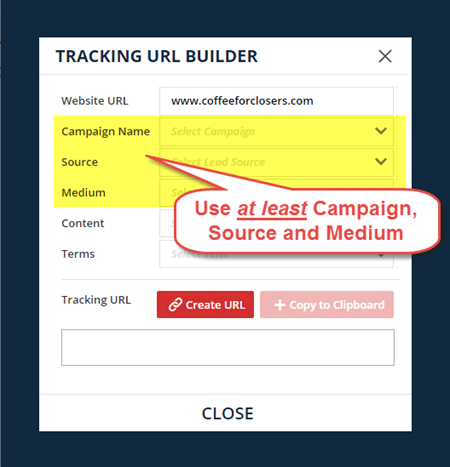 Copy the URL to the clipboard to use in your ads, backlinks for blog posts, email messages, landing pages, or any place else you'd like to capture marketing tracking information. Q. I have some odd lead Source parameters reported in some of my campaigns. Why is this? I don't even use lead Source UTM all that often. A. You should always use all three of the main UTM parameters, utm_campaign, utm_source and utm_medium with every link you are tracking. Because the UTM parameters are stored in a cookie, and the cookie values are only overwritten when a new link is clicked, you want to ensure all three of these values are consistent. If your contact clicks a link with all three, then a link with only utm_campaign and utm_medium the utm_source will report the prior value. Q. How can I drill down to see the Contacts that clicked my UTM-powered link in one of my campaigns? A. The metrics in the Tracking section are designed like Google Analytics - they give you an overview of customer behavior. You can use Contact Groups or Tags to segment your list by purchases or page visits. Q. I created an email campaign with UTM parameters in the links, and I see many more clicks recorded in the Messages library than I do in the Tracking section for each parameter. Why is that? A. 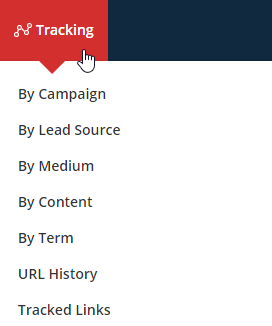 The metrics in the Tracking section record clicks only from contacts who originally opted in using a UTM powered link and have at least one value in the Campaign, Lead Source, Medium, Content, or Term fields. Q. I want to see statistics for all my contacts, and not just those who opted in after I started using UTM tracking. How can I do that? A. Use a Dashboard metric or the reports in Sales > Reports for the overall behavior of your entire Contacts database. Q. I can't see a Tracking Tab in my main navigation. How do I fix that? A. Only ONTRAPORT Pro and above accounts have access to Marketing Tracking. If you are in an ONTRAPORT Pro, Team or Enterprise account, you may not have Tracking enabled or your user seat does not have permission to access this section. To enable Tracking, see the How to Add a Marketing Tracker section in this article. To check if your user seat has permission to see the Tracking tab, check out this Roles and Permissions article and ensure the Marketing checkboxes are marked. You may need an administrator of the account to adjust the permissions. Examples of lead sources, mediums, content and terms would be good and elaborate more on what to do with the link. Examples of various ways would be hugely helpful to us newbies. Can you please explain more in detail. I used Leadsource in OAP and now in Ontraport I am liitle bit lost. UTM parameters are used by Google Analytics, and we have adopted their nomenclature. You can do a search for using them and there are dozens of examples out there. We gave one in the article where a lead was brought in from a Campaign named "TrackingDemo" via an "AdWords" ad that charged by the click ("PPC") that had the offer "50% off candy sale" and the term (keywords) "candy sale". You do not have to create the parameters in ONTRAPORT first. You can use Googles UTM builder if you like, or create the URLs on the fly. ONTRAPORT will record them and create the campaign, lead source, medium content and term categories when the form is submitted. Note: edited Jan-30, 2015 to correct non-standard lead source and medium terms. Is there a reason that you cannot just put these entries into the form using hidden fields... like: input name="utm_source" type="hidden" value="myvalue"
I am trying to do this and I am not having much success. Also I cannot add other custom entries. Is there any really good documentation or troubleshooting docs? Christiaan - if you are using an ONTRAPORT Smart Form (or Order Form) the hidden fields are already there. In addition to the ONTRAPORT Smart Form or Order Form, you need the ONTRAPORT Tracking Script on the page where the form is placed. (The Tracking Script is available in the Administration section; our Landing Pages and any WordPress site with our PilotPress plugin will include it automatically). The Tracking Script is needed to count the number of visits to the page using the parameters, and our form is needed for the opt in. There is code in both the form and the tracking script that is needed to communicate back to ONTRAPORT. You need both to make the system work correctly. If you were successful in pre-filling the hidden fields on the form without the Contact coming to the page with the marketing tracker parameters in place in the URL as intended, then all of your conversion stats would be compromised. Is the tracking code/wordpress plugin required to make this work or can we just use a page with a smart form in it? Also how do we fill in the referring page field? Links from HTTPS (secure) sites to HTTP landing pages will never have a referrer listed. This is part of the spec. iOS Mobile users will not have a referrer if they choose to open the link in Safari. All of this is beyond our control, of course, so it's not something we can change. Hi Christiaan - thanks for the update! We do create the parameters on the fly, so if it isn't happening with our raw HTML Version code then something is wrong. Support should be able to sort it out!